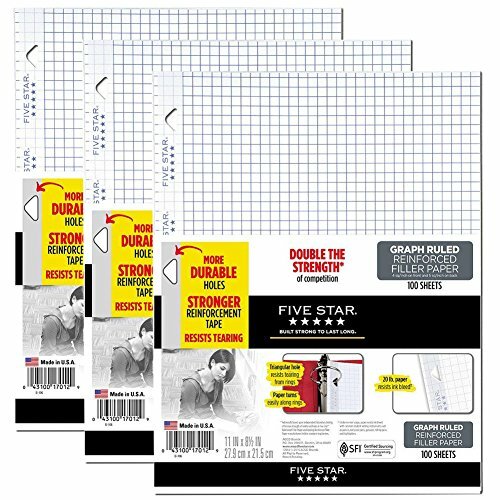 Five Star Reinforced Filler Paper is double the strength of the competition* and stays securely in your binder. More durable, patent-pending triangular holes and stronger reinforcement tape resist tearing from rings. Heavyweight, 20 lb. paper resists ink bleed** and provides a high-quality writing surface for your notes and homework. Triangle-shaped holes help pages turn more easily. Made in the U.S.A. 3 packs of 100 loose-leaf, graph ruled, double-sided sheets. Front of sheet is 4 squares/inch graph. Back of sheet is 5 squares/inch graph. Overall size of 11" x 8 1/2". *Test results based upon independent lab testing of tension strength of reinforced holes in Five Star Reinforced Filler Paper and leading Reinforced Filler Paper manufacturers held in standard ring binders. **Under normal usage, paper resists ink bleed with common student writing instruments such as pencils, ball point pens, gel pens, felt tip pens and highlighters. 3 packs of 100 loose-leaf, graph ruled, double-sided sheets. Front of sheet is 4 squares/inch graph. Back of sheet is 5 squares/inch graph. Overall size of 11" x 8 1/2".